Most of the recipes here at Hochiak! Delicious Asian Food are Chinese as I am Chinese. However, there are thousands of recipes out there which represent Asian food which Iâ€™ve yet to discover or learn how to cook them. Update : Okay, I think the kitchen here looks fine now. Woohoo! I always read The Star newspaper and like any other day, one of my favourite pastimes would be to read the newspaper. A day is like incomplete if I do not read the newspaper. So, as I was flipping through the pages of The Star yesterday, I noticed a familiar picture. It is a picture of a plate of Mee Rebus which I took when I did a food review back in August. As I read further, I then realised that it was highlighting the post I did on Rosli’s Mee Rebus. 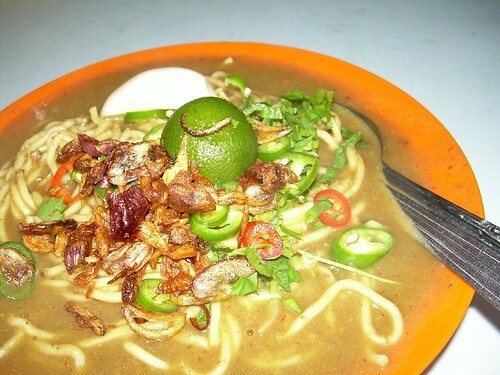 A smile was brought to my face to see the article highlighting the Mee Rebus food review. To those of you who have just arrived at this site courtesy of The Star Online, Welcome! In case you’ve been wondering, I’m now in Kuching, Sarawak for a 10 day break. Been here since Monday and will get back to Kuala Lumpur on Wednesday. It’s been a feverish holiday so far as I’ve been down with fever and stuff like that but thankfully, I am now on the road to recovery after trying out chinese traditional medicine for the 1st time in my life! I’ve managed to take down some recipes from my mother in law and you can expect recipes like Kuih Lapis (layered cake), pineapple jam (for pineapple tarts), teochew dumplings, sauteed chicken and other mouth watering dishes when I get back. I got to keep this short as I am using a dialled-up line which is extremely slow. Till then, check out my archives at the All Recipes page and happy cooking!